Some days are better than others, some we simply can’t put words. As was the afternoon just yesterday. It literally smelled like an expensive garden. The grand entrance beckoned in a romantic dim lit set up. They spoke in hushed tones and right at the front was a girl, holding a guitar. ‘She is gorgeous’ is the first thing that came to mind. A lovely chocolate human and when she sang she dripped gold. I later learned her name is Agolla. Her hands on the strings was like a whoop up of soul and orgasms. Sounded like the last thing I’d want to listen to away from the cares of the world. As I walked in, a lovely set up with colourful martini glasses caught my attention. Red, Green, Orange…I could have sworn, those glasses winked and seductively crossed their legs. 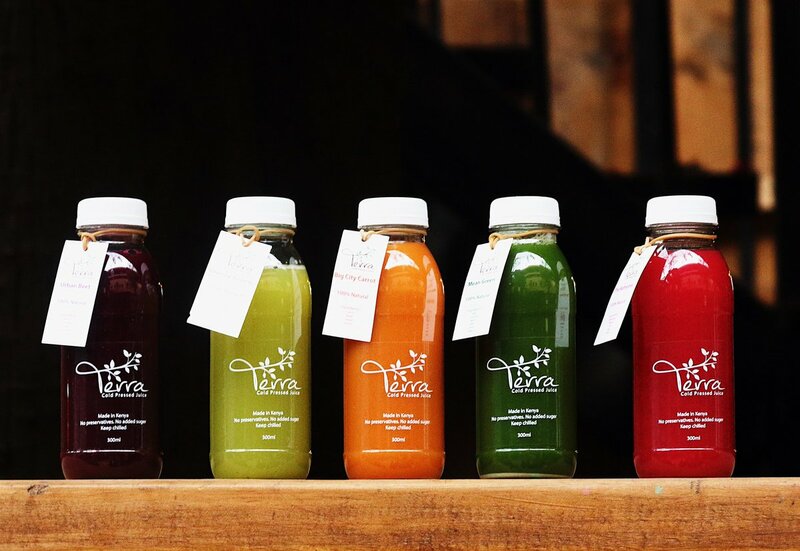 So that was Terra, not to feel terrified for anything so lovely almost sinful, Cold Pressed Juice. The taste was ‘interesting’,not as sweet as it’s colour but neither was it plain like it’s intention. It was refreshing, like the first smell of earth when the rain first hits the ground. They say, it’s the thought that counts, with Terra, thoughts did not matter much. To have known however that this juice was actually life did count. 100% Natural, not a drop of water, sugar or preservative. Like the irony life has made us believe in, how can something be so good for me and my taste at the same darn time? Like the perfect dinner date with the perfect man on a perfect evening. It had to be one treat after another and so dessert was served. Hagen-Dazs is literally a scoop into the finer things in life. Made from natural ingredients sourced from their best indigenous homes. It’s an explosion of creameries, textures and flavours mercilessly devouring your tongue. Oh and it’s full to the brim, literally your ice-cream experience begins where your lid off. It all felt like a stary night beneath the sky overlooking the New Years’ fireworks display. At lest that’s the goosebumps effect Yours Truly literally brought me. He’d fondle with my emotions like I was newly in love, then knot my thoughts into playful balls he’d yo-yo with and finally smother me in word play I could not break free off. If I ever die and want my Biography done, tell him, it was my dying wish to craft my life in his words and share with the world. Just like skin brushing on skin, would give me a little rash, I wanted him to remember my touch. Recall my scent when I was already long gone. Everytime I was around I wanted him to think of his favourite snack. At this very point, Selenkei reached out. It was the touch I had longed for and the smell of chocolate and the love for it. Smooth, tender and good for me she said. We all need a body creme that can do all this for us. It drizzled a little outside and it was getting dark, it was time to depart from the warmth and an ambience that felt too difficult to leave behind. Everything under the sun has a beginning and the end for a lovely afternoon at the Cafe Ngoma Social 5 had come. An R&B experience is on it’s way. So are Cafe Ngoma Awards for the loveliest of music you will ever hear in Kenya. Until our next date. Stay safe. Nice short read.. I love the creativity and the wording. Hello David, glad you loved it. Thank you and stay subscribed.